Sales Funnel vs Website: What You Need To Know - Who Is User X? Sales Funnel vs Website: What You Need To Know - Who Is User X? I’ve been chatting with lots of sales funnel professionals lately. It bothers me that they all speak against websites and promote sales funnels instead. I decided to write this article to explain how to use websites, landing pages, and funnels together. This creates a winning strategy that is sure to land you more customers and more sales. Let’s take a look at what each part does and then how they work together. Everyone knows what a website is, but just for clarification let’s define it specifically. A website is a collection of related web pages, including multimedia content, typically identified with a common domain name, and published on at least one web server. Websites can have many functions and be used in various fashions; a website can be a personal website, a commercial website, a government website or a non-profit organization website. There are many varieties of websites, each specializing in a particular type of content or use. Inbound marketing is described as websites optimized to attract visitors through SEO. Transactional landing pages persuade a visitor to take action by completing a transaction. The visitor information is obtained in order to add the visitor’s email address to a mailing list as a prospect. An email campaign can then be developed based on responses to transactional landing pages which typically involves a sales funnel. The goal is to capture as much information about the visitor as possible. The ultimate goal is to convert the visitor into a customer. Landing pages often contain clear, concise action-oriented headlines. A good landing page explains the product offer in a clear manner and places visual emphasis on the value of the product or service presented. Marketing experts recommend landing pages remove the navigation menu and limit internal and external links on the page. The form length mirrors the value of the offer. They may also include a relevant image, animation or short video. These pages also tend to contain small icons (i.e. of Facebook, or Twitter) to facilitate social media sharing. Landing pages can be optimized for inbound marketing. They are also used as the destination for targeted ads which is known as outbound marketing. Generally speaking, a sales funnel is a set of activities aimed at a common result. Processes define the best-known way of doing the work or of accomplishing a goal. 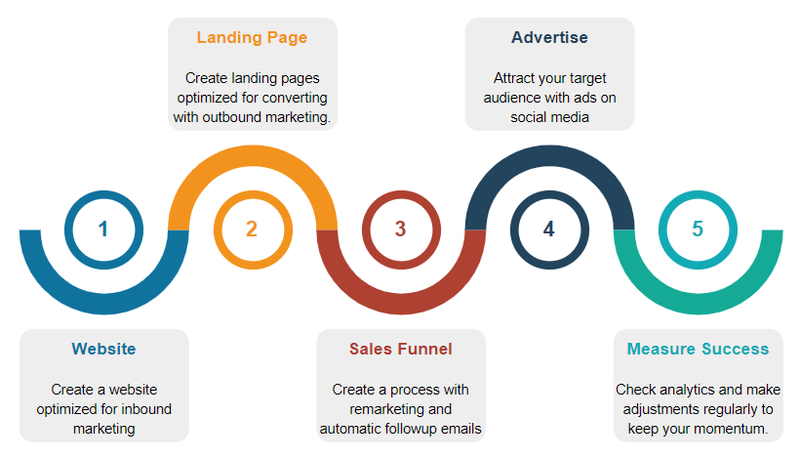 Sales funnels are used to deliver products or services to customers. Sales funnels are simply a special kind of service. They differ from other service processes in one primary respect. Visitors taking action provides the value of the sales funnel. For example, a landing page on a website could be considered a kind of sales process. The headline, body copy, testimonials, and call to action create value. They get visitors to the page to provide the requested information (usually their name and email address, etc.). Likewise, a proposal presentation from a salesperson creates value to the extent the recipients accept the proposal and buy what is offered. Which Do You Use: Websites, Landing Pages, or Funnels? The short answer is you should be using all three! Build a strategy that attracts visitors through inbound & outbound marketing. 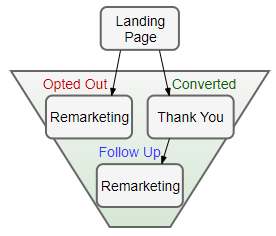 Sales funnels do the work of processing visitors. At the early stages of any project, User X performs a site scan. This scan determines the current state of the website, landing page, or funnel. Once a clear picture is acquired, we build a strategy that will attract, convert and build loyalty by using all of these techniques in concert. Client-Side vs Server-Side: Which side is best for you?